If you disturb fire ants, they don’t mess around. They attack. Technically they bite and sting. When they bite, they clamp to your skin with their two strong pincers. Because of this it takes a lot of vigorous brushing to get them off. After biting, they sting by swinging their tail to and fro. One biting fire ant can sting you six to eight times. Having grown up in the South, I’ve been bitten enough times by fire ants to pretty well know what’s going on before I see them. I know when I feel that distinctive sting (it’s like being touched with a hot match head … for a long time), I’m going to find a lot of creepy, crawling dots. Because fire ants don’t come as singles. They quickly cover a foot, leg, or arm before you know what’s happening. And the little devils don’t leave easily. You have to brush and brush and often take off some apparel to make sure they’re not clinging to that. And I know they’re going to leave a sore, itching spot I’m going to have to deal with for days. Although potentially killer allergic reactions occur, just as they do in bee and wasp stings, I’ve never seen one. But I have seen people with so many stings they literally get sick, and if it’s an arm or leg, there can be lots of local swelling. 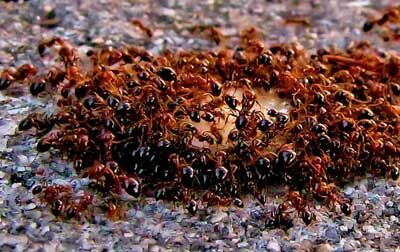 We who’ve been bitten all have our little tricks on how to treat fire ant bites, so let’s dig right in. Ice pack (with a cloth between the skin and pack) or a cool, wet cloth—or anything cool. Apply for 10-minute intervals with a break in between. Antihistamine, such as diphenhydramine (Benadryl) or one of the nonsedating ones. Epinephrine. 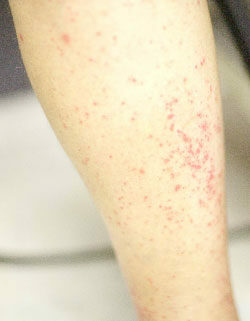 Fire ants can cause the same type of life-threatening allergic reaction as wasps and bees. (See the next section on anaphylactic shock.) And there’s nothing that works as well for life-threatening reactions as injectable epinephrine. It comes in an easy-to-use, pen-like container with a retractable needle called an EpiPen. You can inject yourself or someone else. There’s also a smaller-dosage container you can get for small kids. Read the instructions beforehand, and use immediately if there’s a severe allergic reaction. Everyone should have one of these at home and one in a backpack or bug-out bag because when you need it, you need it immediately. But you’re going to have to ask your doctor for a prescription. You’ll find fire ants, of course, in their nests (large mounds of dirt) but also on trees, feeding on dead things, and even on top of water. They’re the same as in any severe allergic reaction—tightness in the chest, trouble breathing, severe nausea, or a breakout of welts over the body (including areas that have not been stung). Now don’t think these ants are satisfied with what they’ve got. These biting invaders first came to the U.S. in 1939 on a South American ship anchored in Mobile, AL. They quickly spread throughout the Southeast, into the Southwest and California, and along the Atlantic Coast. And now they’re moving northward, wiping out other ant types as they go. What about you? Have you ever made a fire ant mad? How did the sting feel? What did you do? Why Mosquitos Don’t Like Rain. 6 West Nile Myths, Busted. Photos: Fire ants: Flickr/KM&G-Morris. Bites: Flickr/JeffKalikstein. Mound: Flickr/Vicki’s Nature. VETERICYN WORKS FOR US !!!! I was picking plums on our property so Mama could make jelly. All of a sudden, I felt the stings and looked down. One leg was covered all the way to the top of my leg and the other leg was covered to the knee with fire ants. I ran, jumped off the bank into a ditch and started running down the road to our house. I was ten. My nine-year-old brother chased me down, dragged me to the pavement and used his hands to rake the ants off. They hold on. I was very ill for a week or so. Now, I never stop walking on grass and just stand there. I always look down, even in my own yard. I am terrified of the tiniest ant now. An attorney in my town was found dead beside his tractor. The autopsy revealed no heart disease. Finally, someone remembered less than a dozen little red spots on one ankle. He had been bitten by very few fire ants. All his family was tested. All are allergic to fire and stings. The instructions for the children’s school: first, use epi pen on child, second, call ambulance, third, call parents who will then go to the hospital. By the way, they do come indoors, build nests, and sting people. Thanks for sharing your experience. It sounds like you still remember it all to well. You know of an Atty who does his.own yardwork? We’ve had good results with tea tree oil. Applied Lactocalamine lotion over the affected areas, and it subsided within 2-3 hours. I had my first encounter with these little devils more than a week ago. The bites look the same today as they did when I first got them. How long does it take for the bite marks to go away? My itching has been minimal which is a God send, but it did wake me up a couple of nights ago when I had to actually get up and put a cream on the affected area. They’re usually looking better within a week. The main danger now is to keep the area clean and not let any get infected. This is what my foot looks like what can do? Assuming you have fire ant bites, the only info I have to offer is in the post. If you’re concerned about infection you should see a doctor. I just moved into a new apt and only have the mattress and appliances moved there thus far. The mattress is on the floor/carpet as of now, (havent moved the bed frame yet) Last night I woke up at 4:30 am with my legs on fire. I pulled the sheet off the top of me and for no reason, found my legs covered with little red fire ants. I have no idea where they came from, (no ant trail). It seems like they sought me out personally and attacked. The ants are NO where else in the apt, NONE. Do these fire ants smell humans from outside or from a far and automatically attack? I have no idea where they came from and I am in agony. They were not there during the past couple days or nights, they just appeared last night. Does anyone have any advice for me about all these white puss filled welts? I am not taking chances, I am going to call in a professional to rid these little monsters. One more thing, they only appeared on my mattress and on the carpet around the foot of the mattress where they climed up. And no, it was not from the mattress from our old apartment. Any answers PLEASE??? As far as I know, ants usually don’t bite unless they’re disturbed. I read on the Internet there is a new species nicknamed crazy ants that are invading some regions of the South. I really don’t know enough about them to give an opinion. As far as the white pus welts, that’s common of fire ants. I was attacked while standing with one foot in the flower bed and the hose in my hand, to turn off the water. I felt them and squirted the water on my leg , which made them stop biting. I then ran inside and put ice water on my leg and took a chlorpheniramine (works better than benedryl). That all pretty much put an end to it, although they were real itchy for a week. At least the burning stopped right away. Thanks. Good thing you had a water hose in your hand. Fire ant stings, or any insect stings or bites, can cause different reactions in different people. Not all go by the book. In turn, many insect stings can cause a local reaction similar to what you describe. Whatever, most get better in a few days. Infection is always a worry. That’s the reason it’s important to keep any sting or bite clean. If it starts looking worse, see a doctor. Try use the green onion! alcohol to clean the injury. than marsh the green onion cover and wrap the wound. I have great result with it.